Take Control of Your Time Now! 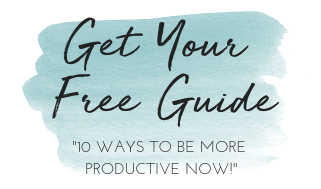 Download your FREE guide, "Defeat Overwhelm with 5 Tips to Skyrocket Your Productivity." Coach, Author, Speaker, Business Owner, Mom, and crafter. I help driven mom bosses grow their business and be present with their family by taking control of their time and productivity. Sign up now to receive your guide and join my mailing list. You'll receive monthly tips to help you find balance, freedom, and more time in your mom boss life.